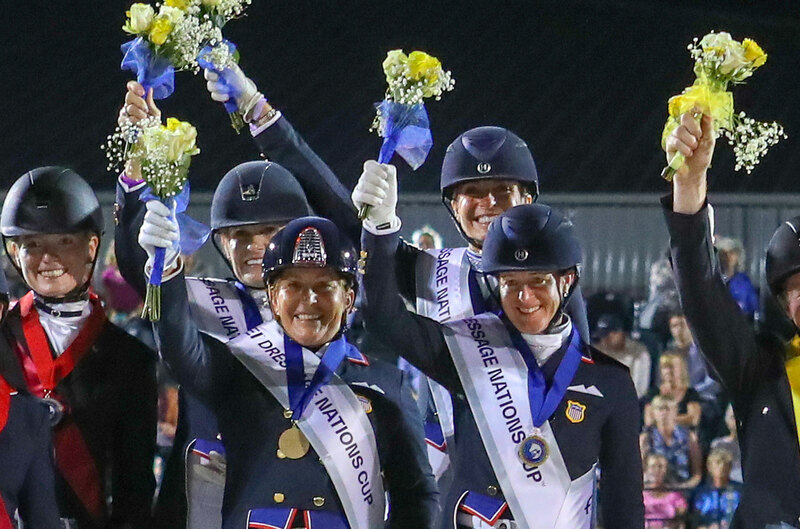 Team USA won the opening event for the 2019 FEI Dressage Nations Cup™ season at Wellington. The Americans - inspired by Shelly Francis - beat off their competitors over several days of exciting Dressage competition in the Florida sun. Joining the American team on the podium were the Canadian team, who took the silver medal, and Germany, who were awarded the bronze. This year’s FEI Dressage Nations Cup™ will feature eight events over the next five months, as teams vie to see who will compete in the finals at Hickstead in July. The Wellington medals came down to the final few rides in the Grand Prix Special. The US team were in the lead after Day 1, which was comprised of both Prix Saint George and Grand Prix competition. Day 2 offered competitors the opportunity to ride the Intermediate 1 and Grand Prix Special tests, with a 1.5 percent bonus added to Grand Prix competitors, versus those doing the small tour. The best of three rides counted for each team, with the lowest score being dropped. The Grand Prix Special is a particularly arduous Dressage test, now performed to music, a recent change to enhance the experience for both competitors and audience alike. Riders are scored not just on movements but on transitions as well, and the judges look for a long list of qualities, including fluency, balance, energy, cadence, and self-carriage of the horse, which depend greatly on the horse and rider partnership. As the sun set over the palm trees lining the Adequan® Global Dressage Festival arena, American riders Ashley Holzer, Jennifer Baumert, and Charlotte Jorst waited with bated breath for their final teammate to complete her test. German rider Christoph Koschel had run into trouble aboard Ballentines 10, electing to retire before Shelly Francis of the USA entered the ring, knowing Germany would finish on a total of 402.724 points. Davis, partnering with the 15-year-old Hanoverian Danilo, gave the judges what they wanted, in spite of a rider error that took the team momentarily out of their test pattern. With collected marks of 71.447, plus the 1.5 percent bonus, the USA finished on 437.693 total points. Would it be enough to top the podium? The last rider of the day, Jill Irving of Canada, would be the deciding performance. Aboard Dutch Warmblood Arthur, Irving was the only Canadian competing in the special, hoping to maintain the high marks achieved by teammate Tina Irwin in the Intermediate 1, who topped the field with a 73.588 percent. Irving turned in a beautiful test for a score of 70.404, which totalled 71.904 percent with the added bonus. Alas, it wasn’t quite enough to beat the American’s marks, and Canada would have to settle for the silver with a total of 433.685 points, leaving team Germany to round out the podium in the third-place position. Shelly Francis had a fantastic week, going on to win the Individual top spot in the Grand Prix Freestyle on Friday, after being the only rider to top 80 percent in that event with a score of 81.840 percent. Her peppy programme music and springy piaffe showed off Danilo’s remarkable self-carriage, and Francis was thrilled to go home with double gold medals. There’s lots more 2019 FEI Dressage Nations Cup™ action to come. Events are scheduled for France, Denmark, the Netherlands, Finland, Sweden, and Germany before the Finals at Hickstead in Great Britain, where defending champions team France will be fighting to hang onto the title. Tune in to FEI TV to cheer for your nation.